The road to financial recovery can be long but, with the right plan, it doesn't have to be. • 66% of graduates from public colleges had student loans. • 75% of graduates from private nonprofit colleges had student loans. • 88% of graduates from for-profit colleges had student loans. (Statistics from the Project on Student Debt) And that was reporting from March 2014, on debt stats in 2012 (that was the most recent data available). Based on these trends, 2015 is going to be...well, grim. But, it doesn't mean your future has to be grim, too. In fact, you're already taking action by reading this article. If you’ve taken out student loans, chances are you’re likely in debt and you’re dying to get out sooner than later. The road to financial recovery can be long but, with the right plan, it doesn't have to be. Use the below tactics to create a plan of action so that you can become debt-free as early as possible and finally start to reap the benefits of your sound investment: your education. 1. Create a realistic budget. Establishing a budget should always be the first step to resolving any debt issues. Why? It’s much more difficult to be frivolous with spending when you see where your money is going! If you feel you are able, create your own budget in a spreadsheet using Excel, detailing any income, bills and other expenses. Try to see where you may be able to cut down on costs to help with paying off any debt faster. If you would like to utilize free personal finance tools instead of creating your own budget, Mint.com and FinAid.com have great free resources. FinAid has a free Student Budget Calculator which can help you create a jumping off point, but you’ll have to keep track of your budget from there. For a more interactive personal finance tools, try Mint.com. You can use their website or app to fill in your information and a budget will be created for you and they will even send progress updates to help keep you on track. Some find that following a “cash only” policy for their daily expenses works because you can only spend what you actually have. Once you’ve created a budget, determine what you are able to spend per week on your daily expenses for groceries, coffee, lunch or whatever else you may need. Keep your cash somewhere – many people like to use an “envelope system,” keeping their weekly allowance in an envelope and taking out money as necessary each day. Once the cash from the envelope is gone – that is it. It’s much easier to see where your money is being spent when it’s taken out of your hands rather than being swiped on a card. You are also much more aware as the envelope begins to feel emptier as the week goes on. A cash only policy is easiest way to stay on track with your spending because you’ll always know you’re spending money you actually have! 3. Pay more than the minimum balance. When you continually pay minimum balances, it doesn’t actually impact paying off your debt. It actually extends it. If you actually want to begin getting rid of debt, start by paying more than the minimum balance (whatever amount over that you are able) weekly instead of monthly. If that’s not possible based on your budget, try doubling one of your minimum payments each month. You will start to see the debt reduce much faster than it was before with just the minimum payments. 4. STOP using credit cards. If you’re living off of credit cards – stop. Take them out of your wallet, put them in a drawer and delete all of your saved credit card information from online stores and apps. Even if you’re justifying it by saying that you’re earning cash back, rewards, etc. – it’s not worth the debt you’re accumulating. Deleting all of your saved information online and from apps may seem silly because it makes the checkout process much easier. However, making the checkout process easier also makes it much easier to make impulse purchases for items you don’t need. If you really want to save card information for a site or app, replace credit card information with your debit card information because it’s easier to keep track of your finances that way. Again, sticking to cash is the easiest way to keep track of your money because you’ll always know it’s money you actually have! 5. Pay off debts with the highest interest rates first. It’s always best to tackle loans and credit cards – whatever type of debt you’ve accumulated – with the highest interest rates first. Interest accumulates and you end up paying a lot more in the end, so getting rid of that first makes the most sense financially. 6. Put any extra money towards debt. If you receive some extra funds for whatever reason, don’t go shopping, to the bar or splurge on something frivolous! Use that money toward your student loans or other debt. Sure, it’s tempting but it will be worth it when you’re debt free and can buy whatever you like! 7. Sell stuff you no longer use or need. As mentioned in number one, examine your budget and consider areas where you might be able to cut down. Small things really do add up. You just need to decide what you can survive without living in complete misery. Consider - is my debt worth this luxury? Do you buy coffee a lot? Consider making your own. Could you cut down on carry out? What about your extensive cable package – could you scale it down a notch? All of these daily factors are expenses that are, ultimately unnecessary and could make huge differences in paying off your debt faster. Depending on your situation (and your motivation), you may want to consider some extreme measures. If you consider your debt situation dire or you just really need to get out ASAP, there are measures you can take to speed up the process of getting out of debt. • Get as many side jobs as you can handle – the best are those which you are able to get paid tips for cash, like being a waitress, nanny, bartender, etc. That way, you'll always have cash on hand and will never be stuck waiting for your next paycheck. You'll also be able to easily utilize tip number two on this list. • Could you find a cheaper cell phone plan? Also, don't forget to keep a sense of humor about the situation. Yes - it is serious - but you will survive! 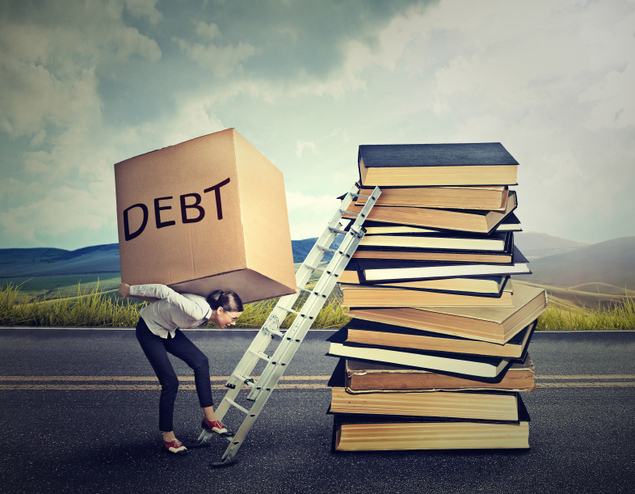 Our friends at NerdWallet have done a great job at highlighting the lighter side of things only people with student loans will understand so, remember you are not alone in this! Remember, reducing your debt isn’t meant to be easy. It’s takes strength, determination and commitment. Think of how much happier you’ll be once you’re debt (and worry) free. While, you may not be completely worry free once you’re debt-free but at least you won’t be worrying about student debt!